Every year for Father's Day, my dad asks to go out for a burger. It's become somewhat of a tradition. A few years ago, we turned this tradition into a homemade one and started making fresh burgers at home. Last year was my husband's first Father's Day, and we invited both immediate families over and had a BBQ feast. Of course, I'm always looking for a way to kick things up a notch, so I thought I'd try to give my homemade burgers a punch and used my hubby as guinea pig. So tonight, we had a pre-Father's Day dinner. It all started with a trip to FreshCo today. FreshCo impresses me for a few reasons: in addition to the price-matching promise and the affordable food, I love the variety in the store. It's really like two stores in one - a regular supermarket, and an international one. Just check out the produce section - it's so colourful! And you can get so many interesting fruits and veggies - sugar cane, tamarinds, sour sap and a few things I've never seen before! I knew in my mind we were making homemade burgers, so off we went to the meat section, where we opted for ground angus beef. At only $5, it was a steal. We grabbed two packs. And for the surprise ingredient - double creme brie (more to come).Vidalia Onions were also on sale, so I thought I'd surprise my hubby with one of his favourites - French Onion Soup. My version is a bit faux, but it's so good and easy! Here's a selfie of me in line - just 'cause. Minutes later, we were in the car and off to make some culinary magic. And the moment you've been waiting for - the recipe reveals. But first, how good does this French Onion Soup look?! Scroll below for the recipe - you won't believe how easy it is. Slice the Vidalia onions thinly and place in a small pot with olive oil. Sautee until slightly tender. Add beef broth, salt and pepper and worcestire sauce. Bring to a boil, and then lower to simmer. Allow to simmer until onions are clear and soft. Slice mozzarella into rounds. Ladle soup into bowls, add one Paris Toast per bowl and cover with mozzarella round. Place bowls on a baking tray or pizza tray for stability. Transfer tray into the oven and broil until mozzarella is melted and browning. I call this soup faux because I don't actually make the broth - sure, it's a bit of a cheat, but it works and it's delicious! Next up: our kicked up burgers. The beauty of this recipe is you probably have most of the ingredients at home - I did. As I mentioned earlier, I bought ground angus beef, as opposed to regular ground beef. The angus is juicier and will add flavour to your burger. You can also opt to ask the butcher to grind up a sirloin steak - same effect. And if you're not a red meat eater, turkey would work too. Combine the beef, Romano cheese, breadcrumbs, egg, parsley, salt and pepper. Divide meat and roll into balls. 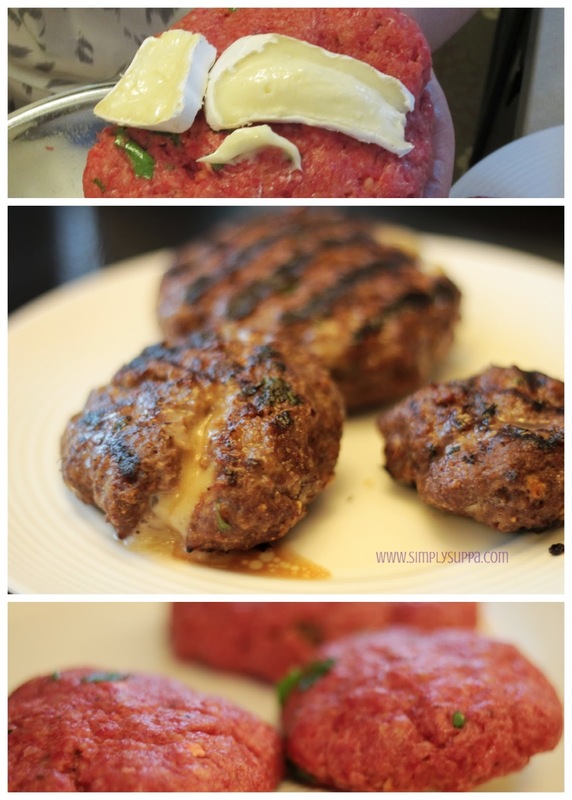 Flatten the meatballs into extra-large patties. Slice the brie and place 1-2 pieces of brie in the centre of the large patty. Cover the brie by folding the patty inwards. Grill for 8 minutes, turning every 2 minutes. Because you've used a high-quality beef, it's ok if the beef is slightly pink. The great thing about these burgers is you can make them any size, add any toppings, and fill with any type of cheese. I'm a gorgonzola lover - next time, I'll be stuffing my burgers with some gorg! Opt to eat your burger the traditional style with a bun, condiments and the works, or like a steak - I had mine plain. It was loaded with flavour. My hubby loved his pre-Father's Day meal, too! Try it out for yourself! My mouth is watering! We have a Freshco near our cottage and I always shop there. Love the variety and prices. Wish there was one closer to my house. Yum! That looks fantastic! I love Brie and Burgers - a marriage made in burger heaven! My husband loves Fresh Co for his catering because he can find a great variety of fresh ingredients. 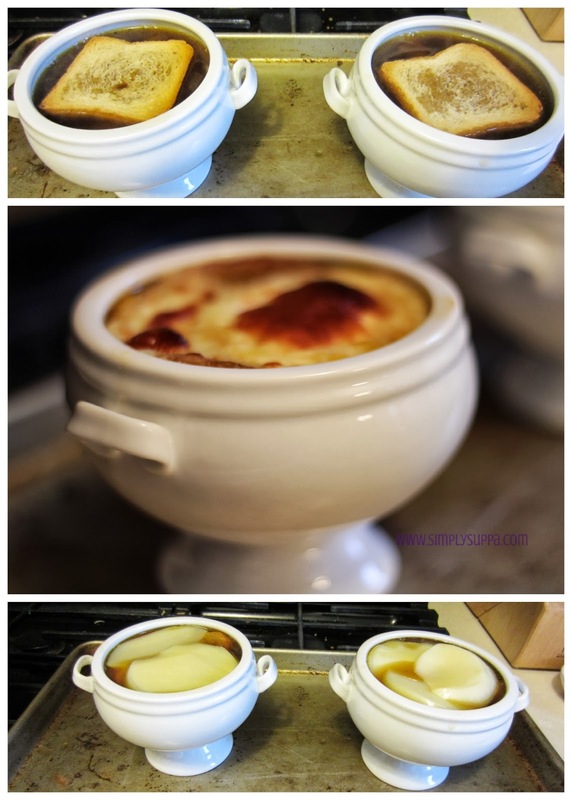 that looks fantastic - I have actually never had french onion soup before; I never attempted making it because I thought it would be super difficult - but you make it seem so easy! Oh I must try those burgers - this whole meal sounds fantastic but brie gets me every time! I recently tried your brie burger recipe and it was delicious, Julia! How can you go wrong with a burger and brie?! Your faux french onion soup recipe is the exact same way I make it at home too. LOL. I just don't tell anyone it's "faux" and just let them think I've spent hours over the stove!